You don't have to be an anglophile or a monarch watcher to know that Catherine, the Duchess of Cambridge, is quickly becoming an international fashion trend setter. There was quite a ta-do made of her Alexander McQueen wedding dress last spring as well as her wardrobe during the Duke and Duchess's recent North American tour. She is being admired for her clothing's simple lines and sophistication. This week, the New York Times reported in an article entitled Are the 'RepliKates' Ready to March? that we'll be seeing the effect of her "timeless" styling in clothing designs for Spring 2011. This is great news for women over 50 who are looking for simple, sophisticated fashions because there will be more choices in stores and online. I'm not sure if it's the so-called "Kate Effect" or fashion's focus on vintage styling right now, but I'm seeing a lot of classic coat designs online. Tailored wool coats, fur-trimmed coats, brightly colored as well as neutral colored coats, and classic double-breasted coats are all the rage. Below is a sample of flattering coats for over 50 women. 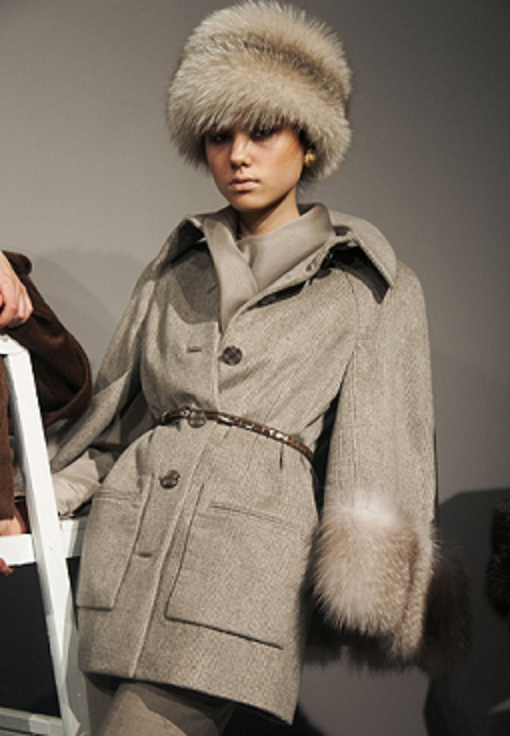 These first two coats from Anne Klein make me smile with nostalgia. Remember the toggle jackets and velvet-trimmed coats of our youth? Can you seriously talk about classic coats without throwing in a camel hair coat and a couple of trenches? I don't think so. I can almost feel how soft this Pure Camel Hair Coat ($498) from Hessnatur is. Double-breasted jackets are just so classic, I just had to download a couple. The thing I love about jackets like these next two is that you can wear them with just about everything--dresses, skirts and trousers. And you don't have to worry about the longer skirt hems hanging below the coat's hem. Animal Print Shoes: It’s a Stampede!